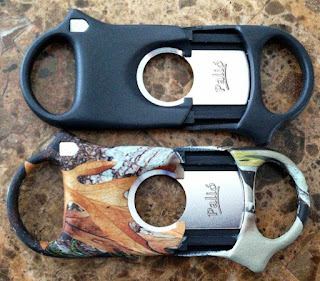 Here we ave the Palio Camo Grand Forest and Black Composite cigar cutter. For this review the main focus will be on the Camo Grand Forest version as the black version is straight forward. The cutter is very light, I was expecting it to weigh more. Though, not heavy, the Palio cutter still feels very well made. The cutter uses a standard guillotine cutting motion. The Palio feels great in the hand, with the "triangular" bump out on either side for superior gripping. As seen in the pictures, the camouflage is well executed, with no noticeable "digitizing" in the design. The camo design is not a cheap wrapper, it appears to be a high quality print. Unlike many finishes, I feel confident that aesthetically it will hold up very well over time. The Palio double blade cuts the cigar cap with precision every time and will handle a cigar up to a 60 ring gauge. The blade is very sharp and guaranteed to cut to your satisfaction. In fact, Palio is so confident in the cutter that it comes with a lifetime warranty. Simply walk into any B&M that sells Palio and receive a new one, no proof of purchase required. Besides the two shown here, Palio offers the cutter in silver, burl wood, and carbon fiber. The suggested price of the Grand Forest is $59.95, the Black version is $45.95. CLR believes this is a reasonable price when taking the lifetime warranty into consideration.